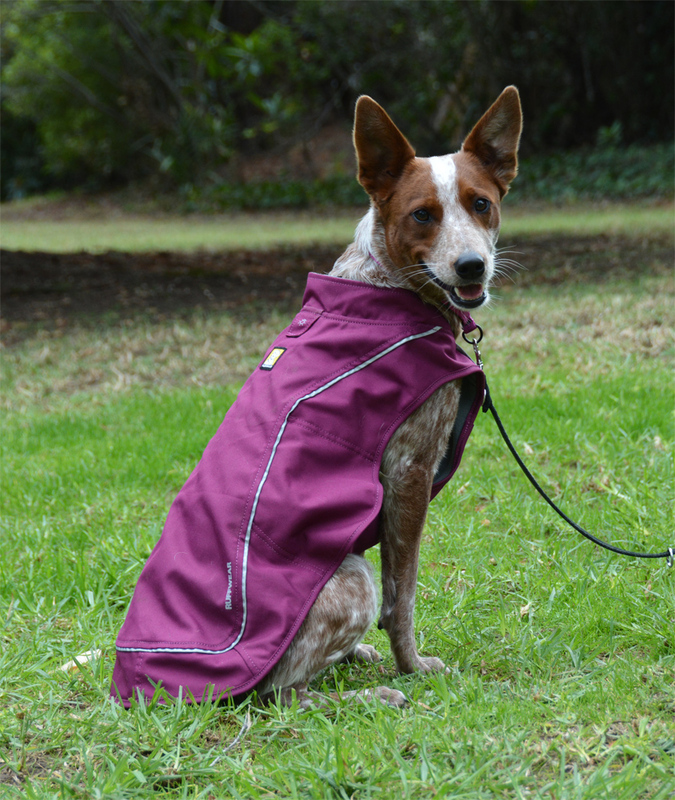 Ruffwear's K-9 Overcoat is a waterproof, fleece-lined winter coat. It features a large belly panel and incredibly durable construction. The outer fabric is smooth outdoor polyester that doesn't pick up burrs and stickers. 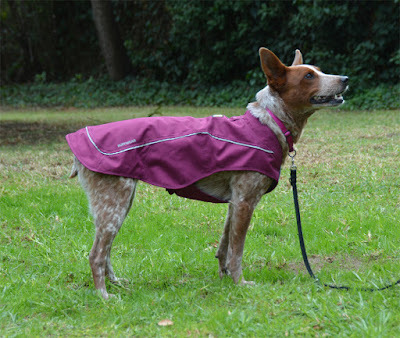 This coat comes in three colors and six sizes to fit dogs with chests 13-42" around. I got a 40%-off Ruffwear coupon, and this is what I did with it. Sisci measures 22" around her chest, putting her right at the top of the size range for XS and the bottom for S. Ruffwear helpfully provides the back length and neck circumference measurements for their products, and the size small measured just right for the length of Sisci's back. 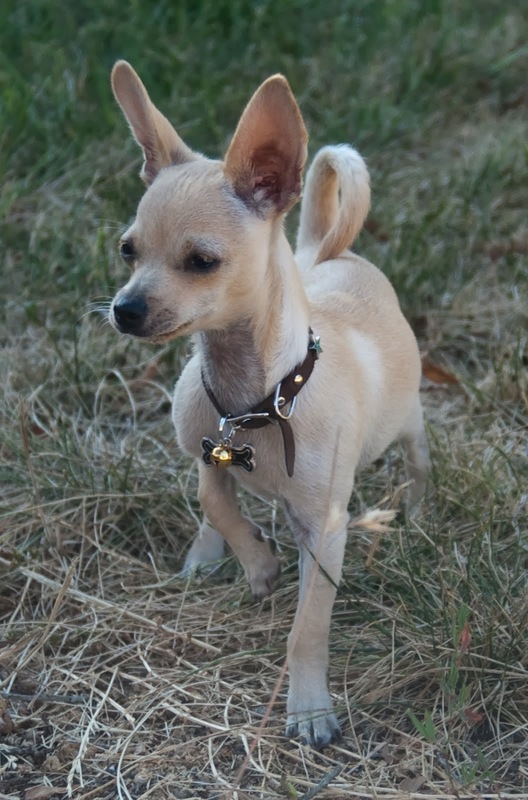 I like my dogs' coats to be long enough to reach the bases of their tails and the small fits perfectly. This is a very easy coat to put on, and does not require any flexibility on the part of the dog. The neck is a fixed size, and the belly part attaches to the top part via plastic quick-release buckles. It is very easy to adjust, put on, and take off. 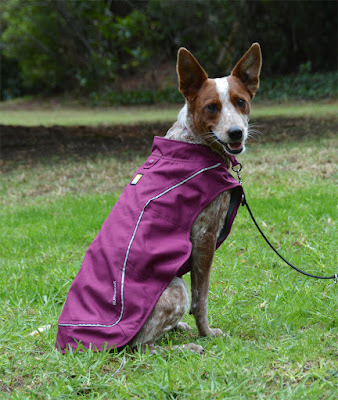 Like the Sunshower jacket, the buckles are hidden in little pockets to protect them and keep them from irritating the dog. Pros: Super durable! These coats last forever, according to their many stellar reviews across the internet. Excellent for running through the woods or wearing to daycare. Nice and long for excellent coverage and warmth, these are definitely sized for long-backed dogs. Waterproof! Sisci and I went for a walk in a rare California rain shower and the K-9 Overcoat kept her nice and dry. Allows total freedom of movement while still protecting the chest and belly. Stays in place no matter what. 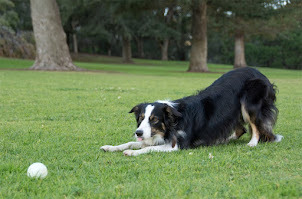 Cons: Can be a bit long on short-backed dogs. Non-adjustable neck can also make it difficult to get a good fit on some body shapes. Belly panel seems to be made to fit dogs with deep chests like pointers, may hang a bit loose on short-backed or fat dogs. Really the only bad I can find about this coat has to do with the fit on weird-shaped dogs. Bottom Line: If you never want to buy a dog coat again, and want something that will last your dog's entire life, the K-9 Overcoat is for you. how do you always know which products I want to try... ;) Because we live in CA, I was debating whether I should get this one or the sun shower. I figure its nice to have a warm coat. Lol, I just want to try everything! I had a Sun Shower for Brisbane and never got any use out of it because there was never a time I wanted to keep him dry but not warm. Sisci has already worn the Overcoat more than Briz ever wore the Sun Shower. Have you tried to apply for their pro user account? That is super dangerous ;) I think the Overcoat is a good choice. 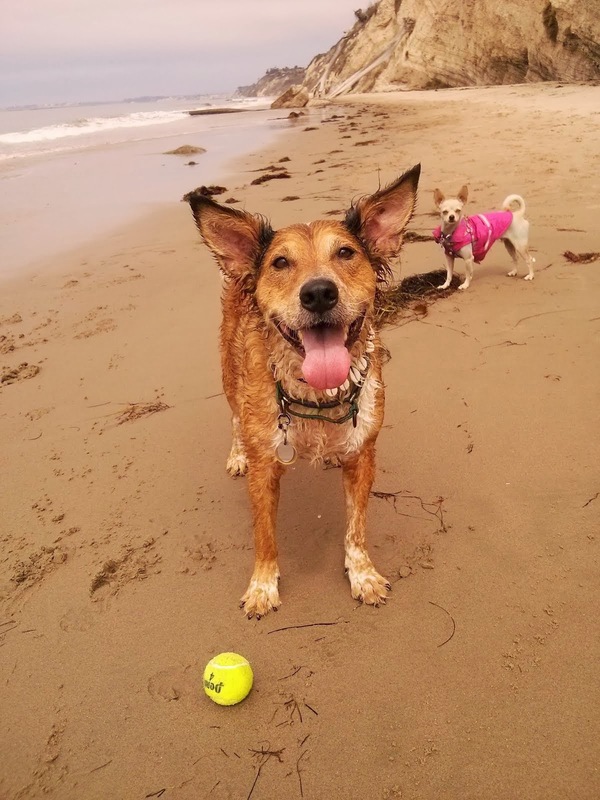 Is sisci a heeler mix? My puppy looks so similar but we aren't sure what she is exactly but almost certain she is heeler. 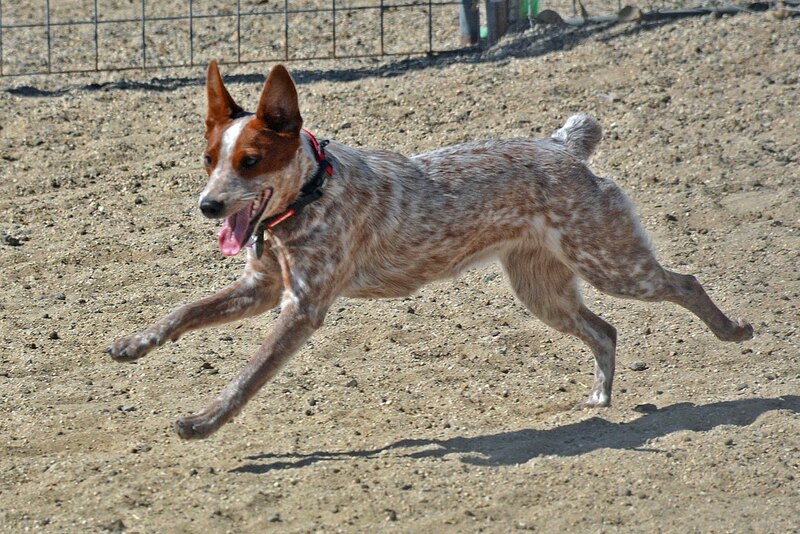 She is mostly heeler, Australian cattle dog is another name for the breed. Thank you! Any idea what else? I was thinking border collie for the other half but my girl is only 20 lbs currently at 5 months, but looks like she might be the size of sisci when full grown. 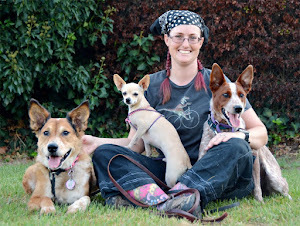 She is actually 1/2 Australian Stumpy Tail Cattle Dog, 1/4 severely inbred Australian cattle dog, and 1/4 Labrador. All her siblings are 50-60lb dogs with floppy ears. I know a number of likely-purebred ACDs around her size though, and the ones I grew up with in the late 80's and early 90's were this size as well.